A 6-7 day, 550 km road bike tour. The north west coast from Skye to Cape Wrath is arguably the finest part of Scotland and this ride gives some of the best road riding in the UK – if you enjoy riding in remote areas but want a ride on roads, this is the trip for you. 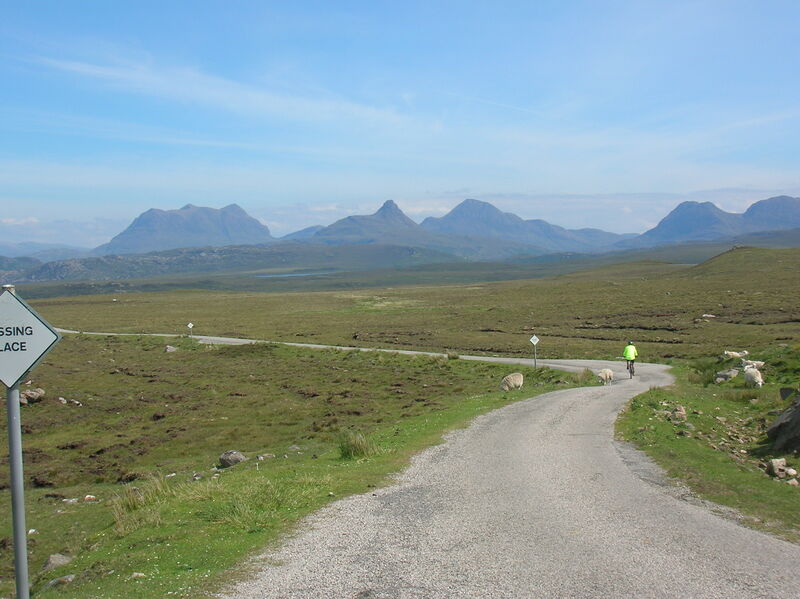 Most of the roads hug the coast, twisting, turning, following the terrain so you can clock up quite a bit of height gain in a day but the rewards are many – windswept headlands, deserted beaches, wooded lochs plus a fantastic backdrop of the islands from Skye to the Outer Hebrides. Strathcarron station makes good starting point if you’re taking the train from Inverness. From Strathcarron head to the north side of the loch, pass through Lochcarron and then head northwards towards Torridon. 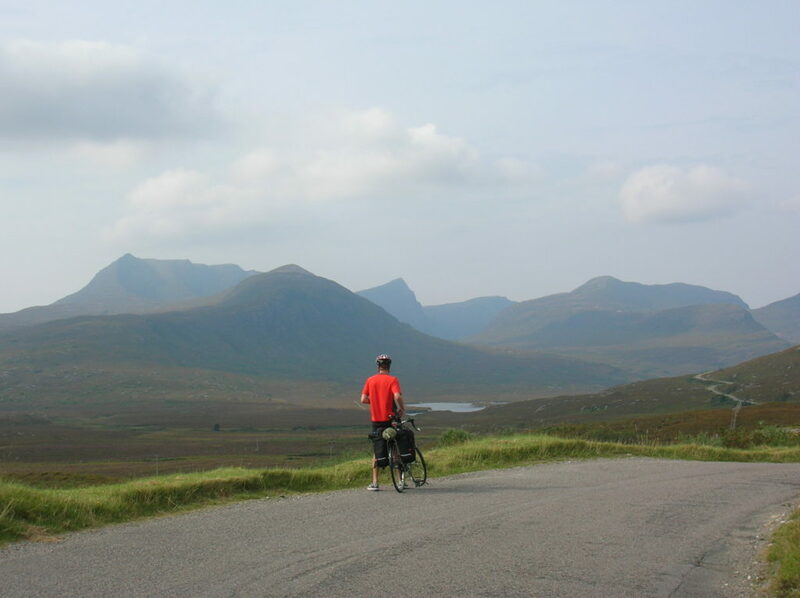 After a few miles you have the option of taking the direct route to Applecross via the Bealach na Ba (626m) with its 20% gradients and spectacular views to Skye and the other islands. If the weather is bad or you prefer a flatter route, continue on the single track road to Shieldiag on Loch Torridon. 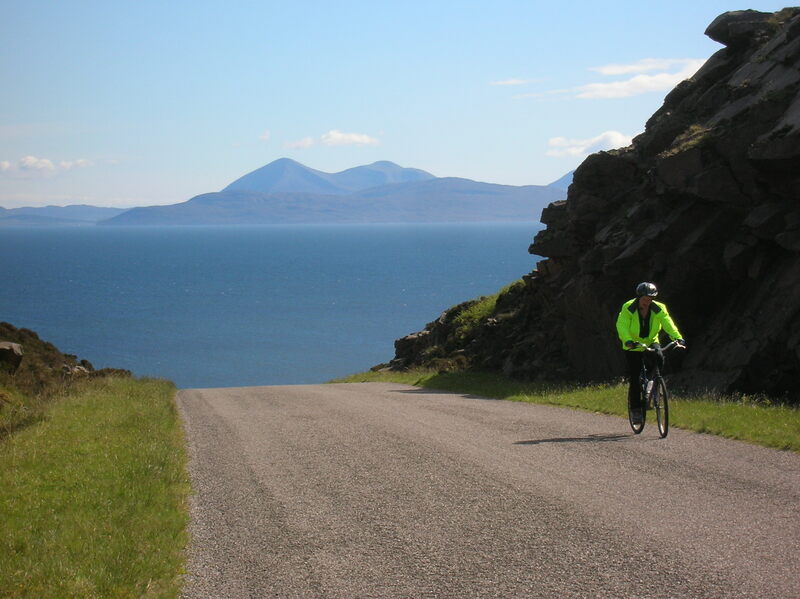 If the weather is good the ride from Shieldiag to Applecross is a fantastic 25 mile undulating ride with superb coastal scenery and great views of the islands of Skye , Raasay and Rona. You’ll have to reverse the ride to start heading north again but it’s well worth it. 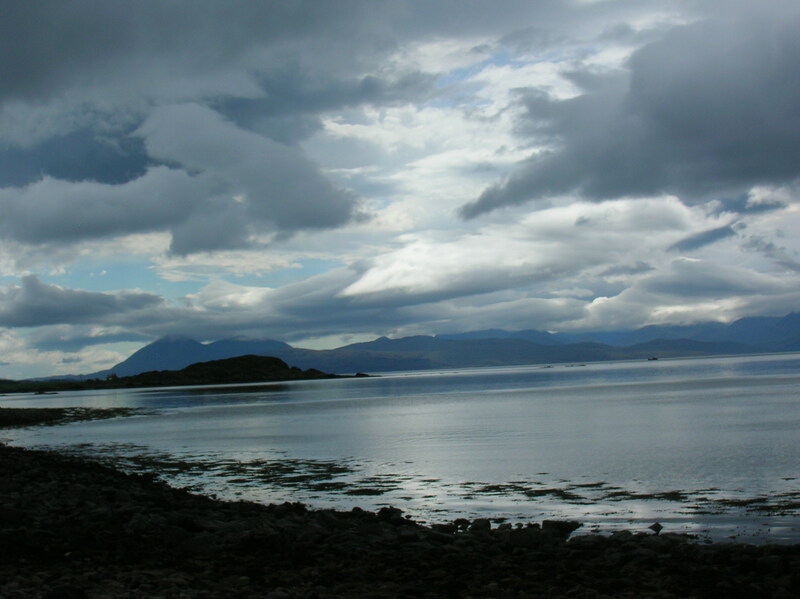 There’s a basic campsite at Shieldiag and a larger site at Applecross. The route from Shieldiag continues through Glen Torridon to Kinlochewe (campsite, bunkhouse) and then past Loch Maree to Gairloch (campsite, and a better one at Big Sands beach) to Poolewe (campsite). All through this area the huge bulk of the Torridonian hills dominate the landscape. 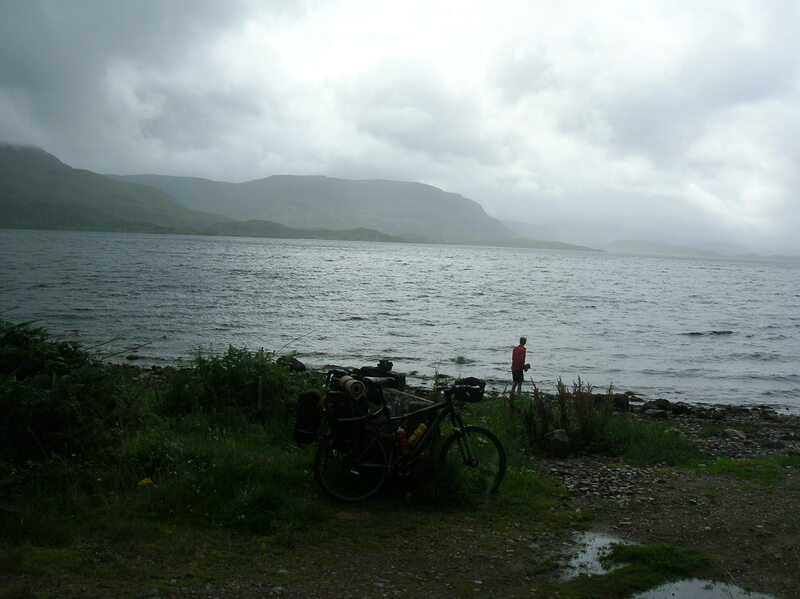 From Poolewe the next 25 miles to Dundonnell follows the coast and the sea lochs, with some long ascents and descents. A few miles after Dundonnell there’s a single track road which heads off left to Badrallach (campsite and bunk house) and provides a very worthwhile detour from the main route and great views of both mountains and sea as the road climbs steadily and then drops down to Little Loch Broom. In the morning you’ll have to reverse it but the views and the atmosphere more than compensate for the early morning climb. 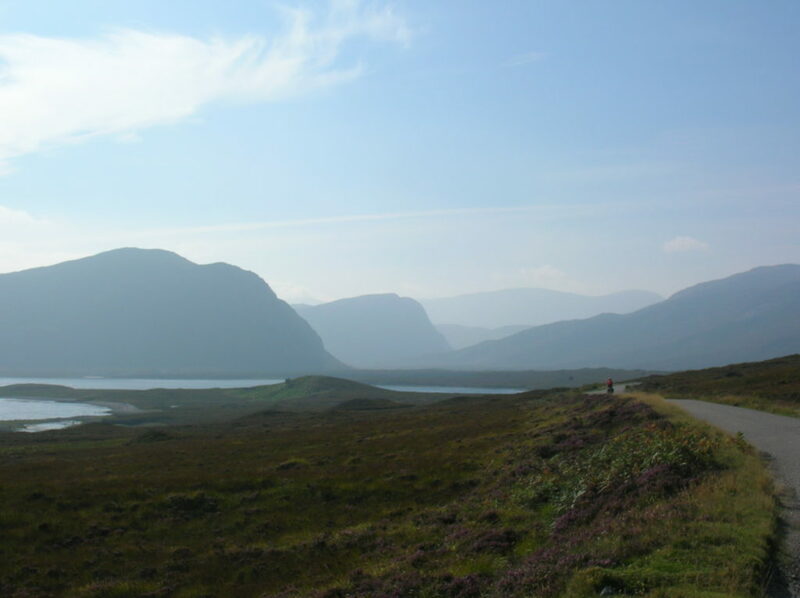 The road climbs again from Dundonnell and then a long descent to join the main Inverness – Ullapool road A835. 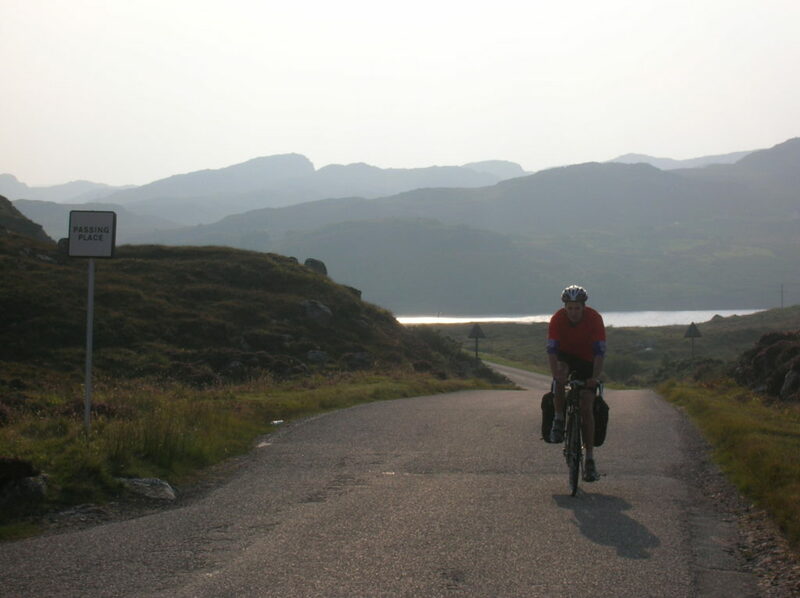 The next 12 mile section to Ullapool is the busiest road on the whole trip – it’s not that busy by A road standards, just tourist traffic and a few trucks. Ullapool is the only town on the route so it’s a good place to stock up with food (large Tesco’s), gas or other fuel (outdoor and hardware shops). It also has a campsite and hostel. 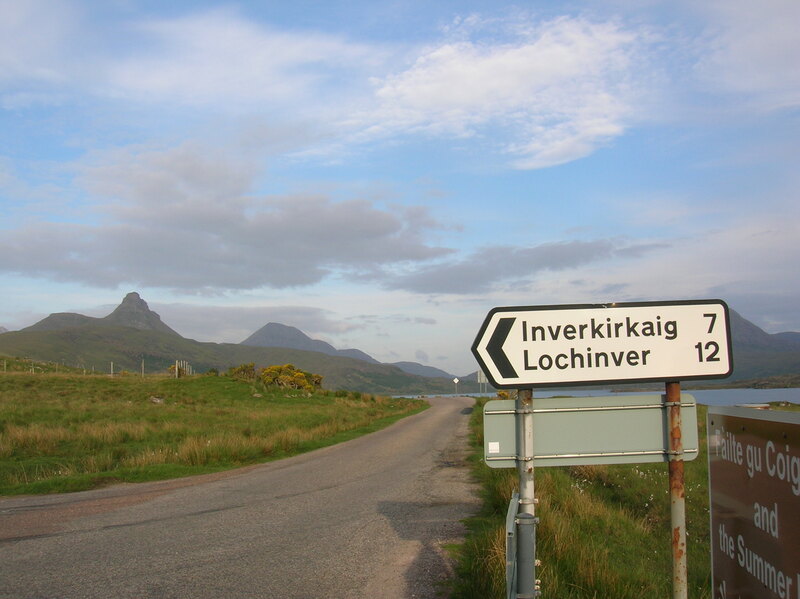 Head north from Ullapool and after 10 miles take a left to Polbain and Achiltibuie. This is the start of one of the most memorable sections of the route – winding single track roads, beautiful beaches and coastline, striking peaks and great campsites. Weave together a route taking in Achiltibuie (campsite, hostel), Polbain, Reiff and then take the coast road to Lochinver (food shop, hostel and small outdoor shop). 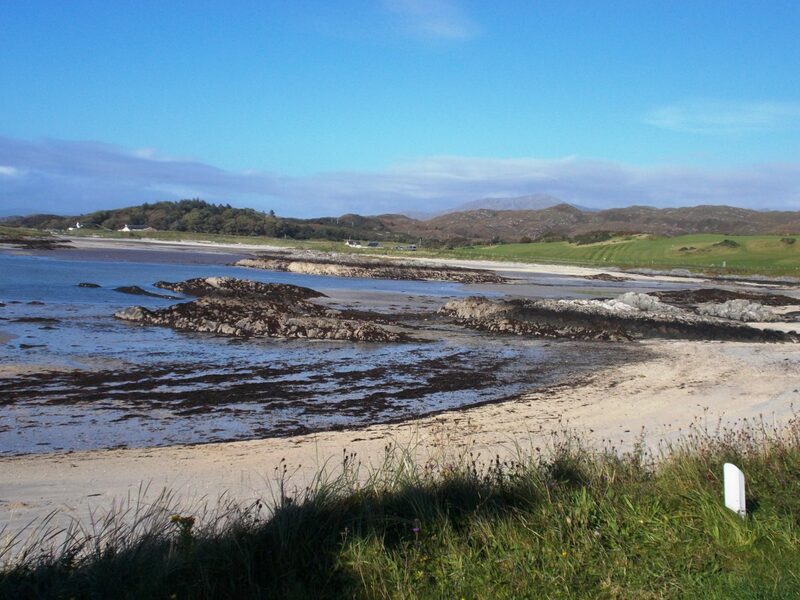 Continue along the coast from Lochinver on the B869 through Achmelvich (campsite) and Drumbeg – there’s a lot of height gain and loss in this section – to join the A894 at Unapool. From Unapool head north on the very quiet ‘main’ road going through Scourie (food shop and campsite) Rhiconich and then a long steady climb on the now single track main road with great views of the Sutherland hills until the final long descent to Durness with its cliff top campsite overlooking the beautiful beach and the north Atlantic. 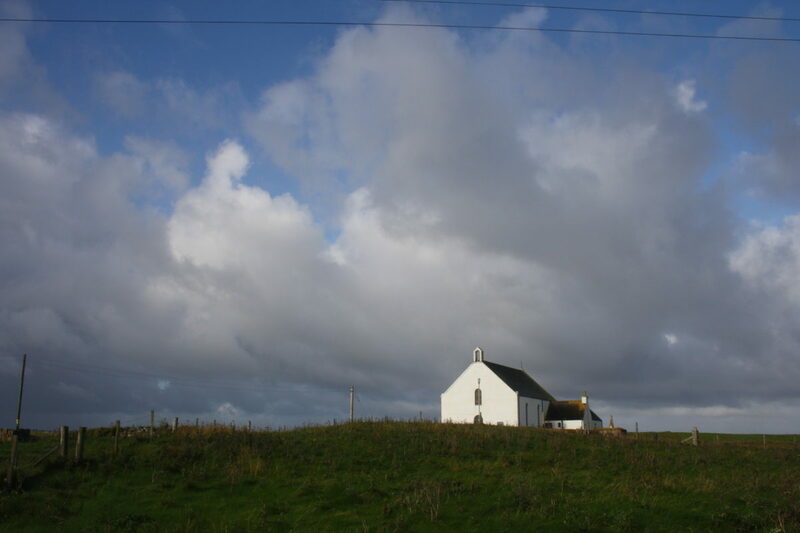 Durness also has a food shop and a hostel. 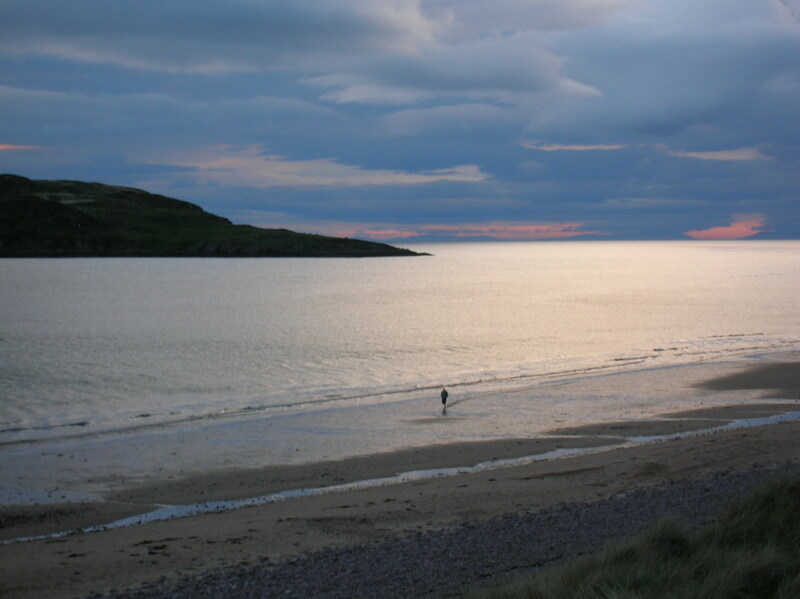 The bike bus to Inverness departs from Durness – see travel section. The beginning of May through to the end of September are the best times to go, with May and September often being the driest and sunniest months. The weather at any time is unpredictable and can change quickly – warm dry weather or stormy wet weather is possible in any of these months. Midges are a significant consideration during the summer months. 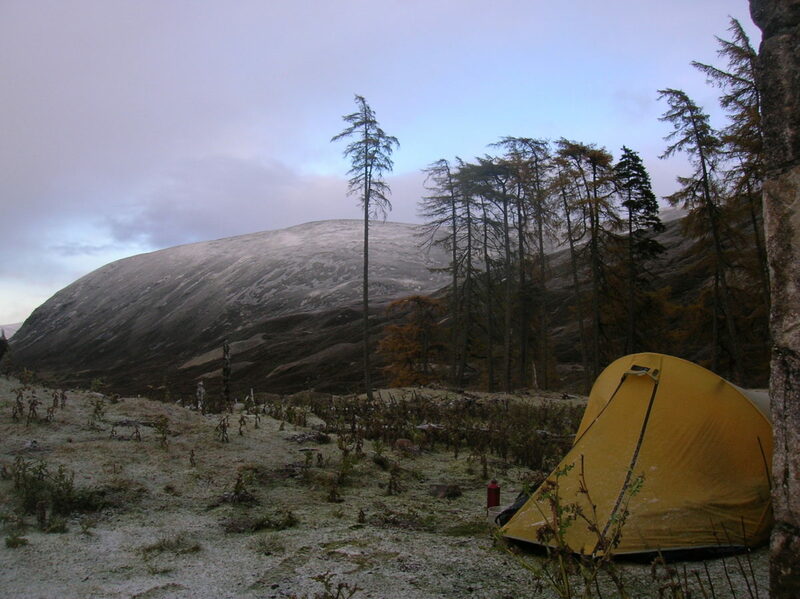 Any time from mid-May to mid-September midges can be around, especially on windless days. See some tips on dealing with midges in my blog. Public transport gives a very straightforward start and finish for this point to point route. Even if you drive to Scotland, it’s easier to leave the car in Inverness, catch a train to the start and then return to Inverness on the bike bus.